Another Blues Brothers 7" from my Jukebox plans that didn't pan out. But that's only for the black vinyl version in the background. While I was grabbing these singles for the jukebox, I started noticing just how many Blues Brothers 7"s were out there with picture sleeves. As I didn't own any of them, I decided to start picking up a few of them. I just tried to buy another one yesterday, but some guy in Belgium was trying to charge me twenty four Euro to ship one 7". I don't know, that just seems crazy to me. I found the picture sleeve, blue vinyl version up on eBay. It appears to be some sort of promotional version, though the sleeve itself is light with information. It does pitch that the movie is coming out on June 20th, so I assume this was released prior to that. The two songs are two of my very favorite by the Blues Brothers. Both appear on the soundtrack album and both also were on the Best of the Blues Brothers album. I wore these songs out as a kid, listening to them over and over. These songs are strictly studio affairs, no live audience at all. In the case of "Gimme Some Lovin'" it is also a completely different version that what is played in the movie (though admittedly, they only play the first few seconds of this song in the movie before Bob shuts them down at his country bunker). 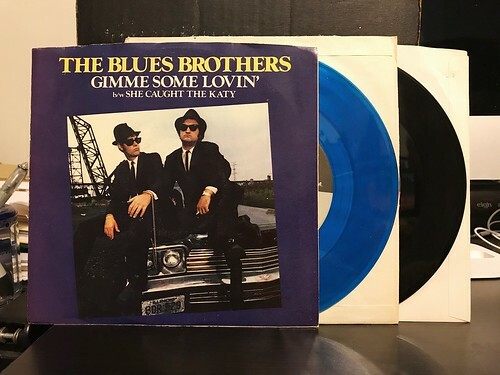 "She Caught The Katy" is definitely one of my top five Blues Brothers songs. I love the slowly building intro and the laid back vibe of the whole song. The horns are expertly placed and the harmonica solo in the middle is just perfect. So many memories attached to these. I'm still on the hunt for more picture sleeves. As most were released outside of America, the postage is going to make them a bit tough to track down. I'm going to give it a try though. In particular, the Japanese picture sleeves look incredible. I hope I'm able to find some of those.